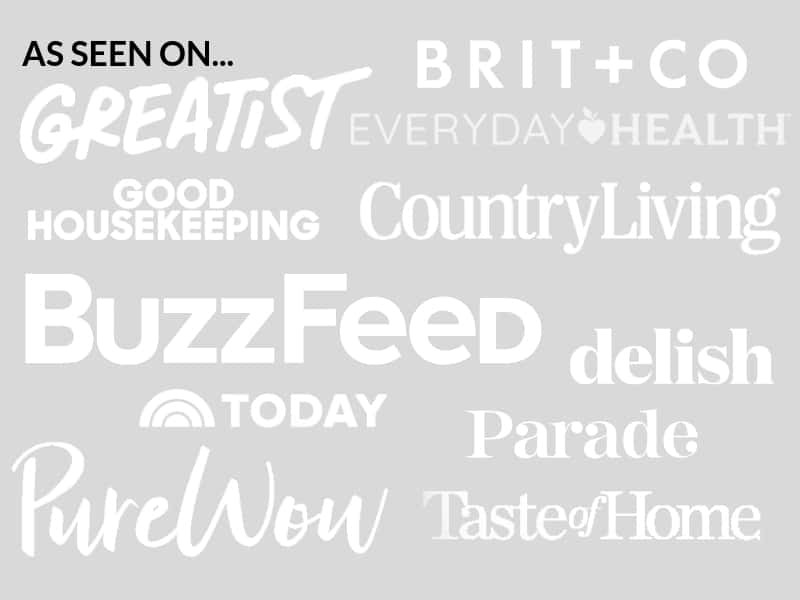 August 16, 2017 By Elizabeth Lindemann 8 Comments / This post may contain affiliate links. 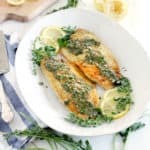 This Pan Fried Sea Bass with Lemon Garlic Herb Sauce is a 20 minute, one-pan, budget-friendly Mediterranean recipe that’s perfect on busy weeknights. Originally, I was planning on doing a lemon caper sauce, similar to chicken piccata. But lo and behold, when I arrived at my refrigerator, I realized I was out of capers. After some quick thinking and wandering around outside, I decided on a lemony, garlicky, fresh herb sauce instead. SO happy I was out of capers. This turned out wonderfully! If you’ve ever made chicken piccata before, the process for this is very similar. First, pat the fish dry. It’s important that most of the moisture is removed from the fish, so it gets a nice brown color on the outside. Next dredge the fish in a mixture of all-purpose flour, kosher salt, and black pepper. Dredging simply means coating it in the flour mixture, and shaking off any excess. You should have a nice, thin coat of flour, salt, and pepper that covers every square inch of the surface of the fish. Then, cook the fish in a mixture of olive oil and butter. The butter gives it a rich, golden color, while the olive oil makes it crispy. Mixing the two is my favorite way to pan-fry almost anything. The fish will only take about 3-4 minutes to cook on each side, if you are using thin pieces of sea bass (I used frozen Barramundi). Once they’re finished, set them aside on a plate. The sauce is made in the same pan in which you cooked the fish. First, add some white wine to deglaze the skillet. I recommend a dry white wine, such as pinot grigio or sauvignon blanc. Immediately after you add it, use a wooden spoon to help stir up any browned bits from the bottom of the pan. Then, continue heating over medium-high heat until almost all the liquid has evaporated. Then, add a little more butter to the skillet and heat until it’s melted. Add some finely minced garlic and a mixture of fresh chopped herbs to the pan– I used oregano, thyme, and parsley. Sauté until fragrant, only about 30 seconds. You don’t want the garlic to burn. Finally, add some chicken stock (or vegetable stock, or water, if you don’t have any), heat until it’s bubbling, then turn off the heat and add some lemon juice and a little more butter. This lemon garlic herb sauce is SO GOOD. It would be great on chicken, steak, salmon, plain on a spoon, mixed into pasta… the possibilities are endless. I used a heavy stainless steel skillet (specifically, this Calphalon one– my favorite!) for this- it works well for pan sauces and deglazing. You can use a well seasoned cast iron skillet or a nonstick skillet as well. Can’t find sea bass at your grocery store? Try the frozen fish section- I used Barramundi. If you can’t find it there, any other kind of mild white fish will do. Play around with the sauce! Add capers or olives at the end, or use a different mix of herbs such as dill, cilantro, and/or chives. 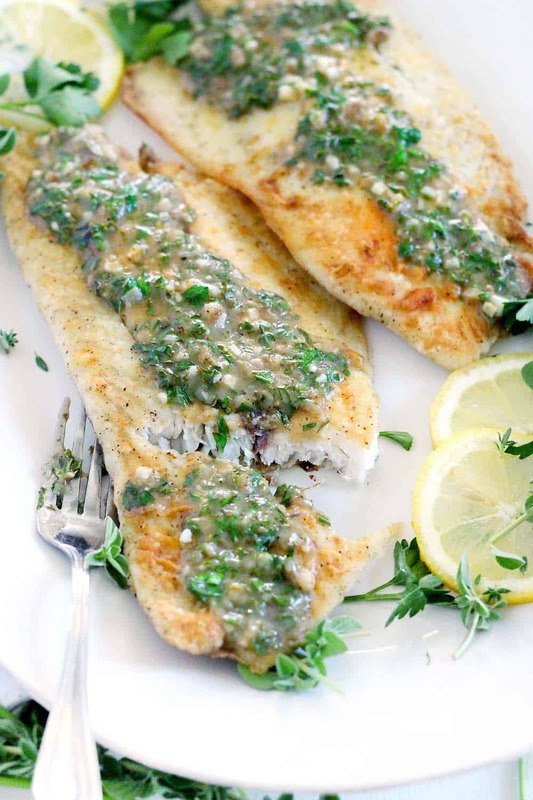 Did you make this Pan Fried Sea Bass with Lemon Garlic Herb Sauce? Please comment below and Rate this Recipe! 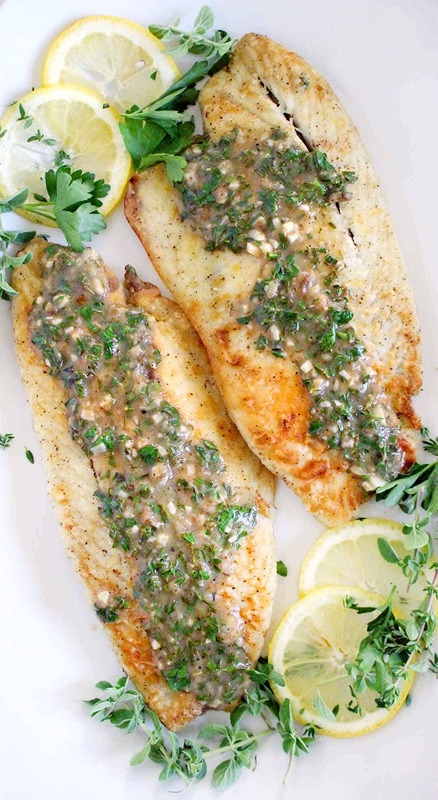 This pan fried sea bass with lemon garlic herb sauce is packed with flavor from fresh herbs. It's a delicious 20 minute Mediterranean recipe that's perfect for a busy weeknight! Pat the fish dry with a paper towel. In a shallow dish, mix together the flour (1/4 cup), salt (1 teaspoon), and black pepper (1/2 teaspoon). Dredge each piece of fish in the flour mixture, coating the entire surface, and shake off any excess. In a large skillet, preferably stainless steel or nonstick, melt 1 tablespoon of the butter over medium high heat and add the olive oil (1 tablespoon). Cook the fish in the skillet for 3-4 minutes on each side, until golden brown and fully cooked. Try not to move the fish too much, especially if you are using a pan that isn't nonstick, otherwise the fish may be more likely to stick to the bottom and not get browned as nicely. Remove fish from the skillet to a plate. Add the white wine (1/4 cup) to the skillet to deglaze, stirring up any browned bits. Continue heating until almost all the wine has evaporated. Add one more tablespoon of butter to the skillet. Once it's melted, add the minced garlic (2 cloves) and fresh herbs (1 tablespoon each of oregano, thyme, and parsley) to the skillet and sauté until fragrant, about 30 seconds. Add the chicken broth (1/2 cup) and bring to a simmer. Turn off heat and stir in remaining 1 tablespoon butter and lemon juice (about 2 tablespoons). Taste and adjust seasoning if necessary. Serve sauce on top of fish. For a paleo option, you can use almond flour or coconut flour instead of all purpose flour, and or more olive oil instead of butter. For a dairy-free option, substitute the butter with more olive oil or ghee. I used oregano, parsley, and thyme because it's what was growing in my garden. You can feel free to use other fresh herbs- dill, basil, or cilantro would be delicious as well! Sea bass comes in all kinds of different thicknesses. You may have to adjust the cooking time if yours are especially thick- mine were thin. 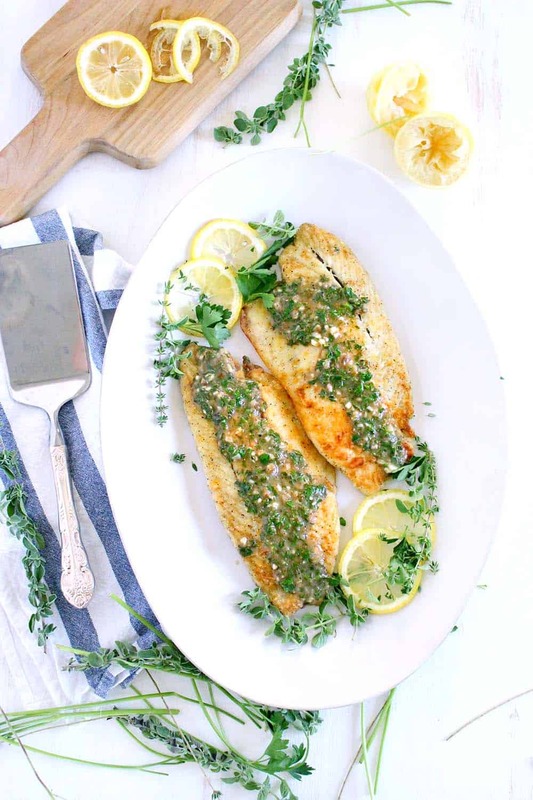 This Pan Fried Sea Bass with Lemon Garlic Herb Sauce recipe first appeared on Bowl of Delicious in August, 2017. It’s been updated to include clearer instructions, tips and tricks, and ingredient substitutions. Can I use dried herbs. I would definitely recommend fresh for this, just because the flavor is fresher. But if you try dried, I use 1/3 of the amount designated for fresh, since the flavor is much more concentrated! I’m going to try this tonight. All herbs will be direct from the garden. Hope you like it! Garden herbs are the best! Oh yay! I’m so happy you liked it! I love this sauce on fish. My other favorite sauce to put on fish, particularly salmon, is just simple butter melted with chives or scallions.